The python hcsr04sensor module source code is available on Github. Use Python to calculate distance and depth measurements with an HCSR04 Ultrasonic Sound Sensor and a Raspberry Pi. The module also works with a waterproof JSN-SR04T sensor. Returns an error corrected distance by using the median reading of a sorted sample. NOTE - The default sample size is 11 readings. This module supports BCM and BOARD pin values but uses BCM by default. See the Raspberry Pi pin layout documentation for your model. Rounds the value to a specified decimal place. Adjusts the reading based on temperature by adjusting the speed of sound. Allows measuring distance or depth in metric and imperial units. Raises an exception if a faulty cable or sensor prevents an echo pulse from being received. 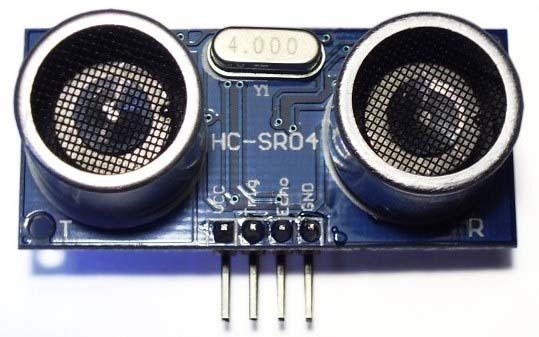 The HCSR04 sensor has four pins. Trig Pin which connects to a valid GPIO pin. Diagram uses GPIO pin 17. Echo Pin which connects to a valid GPIO pin. 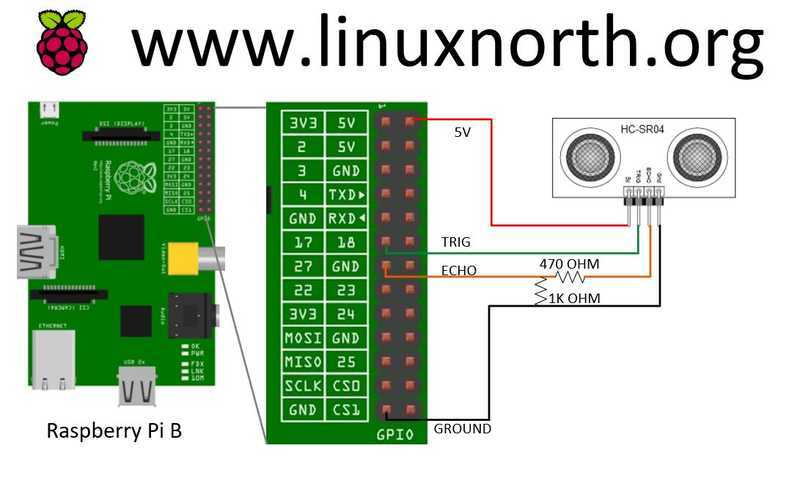 Diagram uses GPIO pin 27. GPIO pins are rated for 3.3V so you must insert a voltage divider as the power pin on the PI is 5V. In the above diagram a 470 Ohm resistor is soldered on the echo wire. A 1000 Ohm resistor is soldered between the echo and ground wires. This reduces voltage to GPIO pin 27 to 3.4V which is within a tolerable level. Failure to do this can damage your board. Voltage divider calculator courtesy ohmslawcalculator.com. Soldering tutorial (youtube) courtesy Xrobots James Bruton. Installation of the module also installs the hcsr04.py utility to /usr/local/bin. This utility allows you to take a quick measurement for testing your sensor. The imperial distance is 12.3 inches. The metric distance is 31.2 centimetres. Example of a measurement from the Python console in three simple lines. Measure a rounded distance in centimeters. Measure a rounded distance in inches. Measure the depth of a liquid in a hole 50 centimeters deep. Measure the depth of a liquid in a hole 20 inches deep. You can also use a stripped down function that does not use the median reading for error correction, does not set the warnings and does not clean up the pins. You do all of this yourself in your code. The basic_distance function can be used for this. Various recipes for measuring distance or liquid depth.